– Employment services payrolls (mostly temporary help jobs) jumped while initial unemployment claims edged down; the general trends of both indicators remain consistent with future job growth. – Consumer confidence fell in January during the partial government shutdown (but rebounded in February). The interest rate spread fell sharply as market participants reduced their expectations for Federal Reserve interest rate hikes. – The moving average measure, which smooths out the volatility, was a more moderate 0.84, though still well above average (“zero” indicates average growth over the 1990-present period). All sectors made positive contributions to the measure. In particular, strong job growth in the manufacturing and construction sectors made large contributions to those sectors. – The household sector continues to be supported by broad labor market indicators such as the unemployment rate but also experienced a gain as the equity market weakness of December reversed. – The University of Oregon Index of Economic Indicators rose in January for the third consecutive month, gaining 0.2 percent over December. 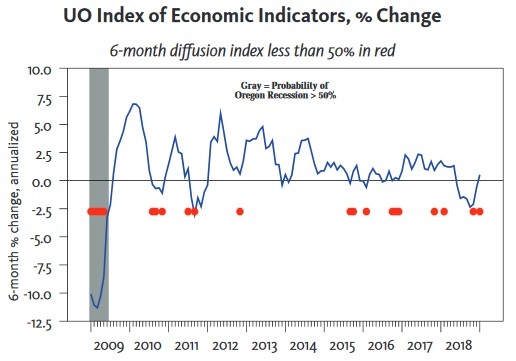 Together, these indicators still suggest ongoing growth in Oregon at an above average pace of activity.